A friend just forwarded me the facebook site, I won’t be joining, but wish you well, and I followed the link here to comment on the lot rather than one individual quote. This is a great idea and obviously an inspiration to lots of people, but, it is normal when giving quotes to reference them, otherwise thy kind of float about in the ether and further discussion or opportunity to look them up in context, or even buy/borrow relevant books its lost. 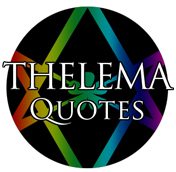 The Book of the Law quotes are referenced here and on fb but the others are not, could anyone adding a quote please simply put the title of the book, and the page the quote comes from to really enable thelema quotes to function to full capacity, if anyone could be bothered to add publisher and year to the quote this would really up the value of this as resource. Otherwise we could be just making up our own, nothing wrong with that , but could confuse a few people as time passes! Best wishes in this project, Melissa. 93 Melissa – I assure you that none of the quotes are made up. All quotes have a reference under them to let you know where they come from and if you scroll down to the bottom of the post you’ll find a link to the different texts where applicable. Thanks for reading. That’s a great pic of Crowley, he really was a Magus! So rare, perhaps you may enjoy my 4774 magickal child proof where the key of it all is given. I happened upon this site loving the “true will, unassuaged of purpose” verse, as it completely sums gnosis, where every wave crest breaks upon the edge of creation.